This is to be an ever-evolving page for those things we only have one or two of. This is one of the later models (serial number D. 3201) in full working order. As you can see from the photos, it bears the splatters of working life but it only saw light use from its previous owner and it was well looked after so it should serve you for many years to come. Please select ‘Local collection’ when choosing delivery options at the checkout (we're on the Essex/Suffolk border). The press would fit into almost any car, but we can help you find a suitable carrier if necessary. The Adana 8x5 remains the most popular letterpress machine in the world which means that both instruction and spares are easier to come by than for any other press we know of. Because of the simple, user-friendly operation, it's ideal for beginners and it's what we always recommend to anyone starting out. 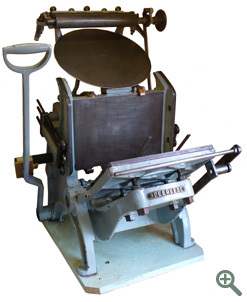 It's a huge disservice to call the Adana Eight-Five a beginners' press, though; this is a well designed jobbing press for professional work and has earned many a man's living. These are Hempel quoins in the No 1 size, which worked with a special ratchet key (not provided) for locking up formes. They were not very reliable, but were an improvement on the previous tapered stick & two wedges system. In turn, they were superseded by Wickersham's, a distant ancestor of todays modern Cornerstone quoins. These antique quoins are a bit rusty (they may be up to 150 years old) and sold as novelties; educational, nice to look at, but not much use as quoins. See our modern quoins if you need something more practical! The only Peerless we've ever seen for sale in the UK, this is a most unusual machine but with the very familiar ‘clamshell’ operation. It's ideal for beginners, or as a step up from the Adana 8x5. Unlike the aluminium alloy Adana, this press is cast iron and steel. The off-set stirrup handle makes this smart press rather compact, but at 11" x 7" it can tackle quite sizable jobs. 6 chases, internal dimensions 11" x 7"
Please select ‘Local collection’ when choosing delivery options at the checkout. 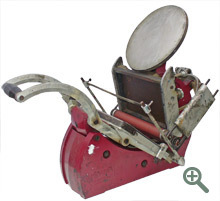 We're selling this letterpress on behalf of Brian Rees, it's currently stored in a dry printshop in Bishop's Stortford, Herts and can be collected by arrangement. The press would fit into almost any car, but we can help you find a suitable carrier if necessary. Our much loved Harrild is an excellent machine in full running order. It has produced most of our books to date but we now have a larger press and need to make some space in the machine room! Acquired from the trade in 2000 (it's still dirty! 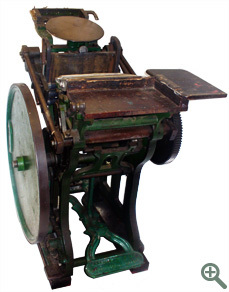 ), this is a clamshell platen with an ‘open wide’ style of movement, rather similar to the American Gordon press, so it's very easy to feed. Also included is a unique collection of spare parts to go with the press, gathered from an identical machine scrapped in about 1998. It is obviously exceptional to find a press from the 1900s with any spares at all, and the spares included with this press make it remarkably good value. If you'd like to see it in action before you buy, we can demonstrate it at any mutually convenient time. We include in the price some dismantling (flywheel off, feed boards off etc) and would assist with loading onto your transport. A Transit van would be about right. The current location is ground level (in a dry garage) on the Essex/Suffolk border. Please select ‘Local collection’ when choosing delivery options at the checkout.